Smaller, smarter, faster and more automated are the big themes at this year’s Association of The United States Army conference. The arms expo outside of Washington D.C. included a exhibition of the latest and greatest weaponry from defense contractors big and small. Here are seven of the more interesting pieces of new hardware on display. Small vehicles that pack a big punch seem to be a continuing theme this year, although BAE Systems’ new Expeditionary Light Tank that features a huge gun really takes this idea to a whole other level. This micro-tank is based on, and a rethinking of, the defunct M8 Armored Gun System. In its revamped form, it appears to include the M8’s 105mm rifled main gun, but also uses components from the CV90 and Bradley Fighting Vehicle. It can also be dropped out of C-130 onto the battlefield. Did I mention it has a huge gun? Northrop Grumman is showing off their new Hellhound six-person light recon 4X4 concept. The concept looks impressive, although the neon ground effect lighting seems a little flashy for this tactical truckster, even for a convention floor. What is this, SEMA? Anyway, the Hellhound can supposedly be up-armored to protect from IEDs and mines, and is stuffed with the latest electronics in an ergonomic manner. It also has a power system that can handle all these electronics with ease. Additionally, it is fitted with a ATK M230 LF 30mm cannon (similar to the AH-64 Apache’s) on a remote controlled turret, which is one hell of a lot of firepower for a light recon vehicle. 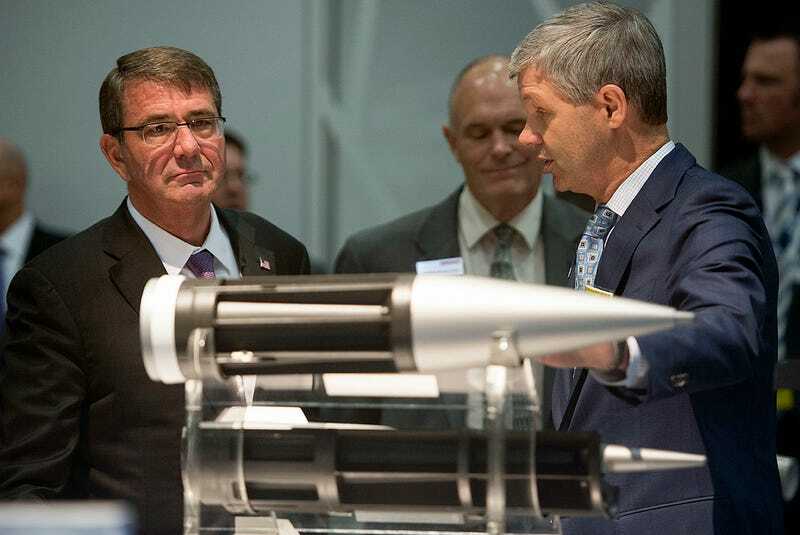 Raytheon is showing off its new Pike mini-missile, which is pretty terrifying. Pike is like a mini-laser guided rocket that can be launched by an individual soldier’s grenade launcher while and guided by another soldier that simply paints a target with a laser designator the size of pistol. Then there is this brute of a robot made by HDT. They call it a “micro utility vehicle” as it can be adapted to multiple roles, and is even able to execute those multiple roles at one time. And yes, that is a light machine gun attached to a remote mount so it is not like this thing can only dig for mines or lug a bunch of crap around, it can also go on patrol. Check out HDT’s website, it’s an interesting modular system. Bell has their V-280 Valor airframe at AUSA 2015, which they hope will mean big bucks over decades if the Army chooses it for their Future Vertical Lift platform. The V-280 differs from the Osprey in many ways beyond just its size and weight. It uses tilting rotor-pods instead of swiveling nacelles, making it lighter and more reliable. It also does not have to fold up or work aboard ships constantly like the Osprey, so it can squeeze more performance out of the tilt-rotor design concept. Since it is aimed at replacing the H-60/S-70 Black Hawk family of helicopters, it has sliding side doors instead of a rear ramp. It is also adaptable to utility, transport, gunship and other roles. The V-280 is hopefully going to fly sometime in 2017. Meanwhile, Sikorsky’s S-97 Raider was also on display at AUSA 2015, whose technology and general configuration will be ported over to a larger transport variant that will compete directory with the V-280 Valor in the not so distant future. Even without this competition, the S-97 armed scout is its own highly promising weapon system. It can do many missions fast and farther than attack helicopters can today and will likely find a home with special operations units before it finds one with conventional units. And yes, it does look like something Bruce Wayne would borrow from Wayne Industries’ Applied Sciences Division. AUSA 2015 also featured some water-borne vehicles, one of the most interesting of which was the Dragonspy jet ski-like drone made by Neamy. Dragonspy can be used for surveillance, patrol or attack, and with the help of an unmanned aircraft communications relay, it can be controlled over a range of 100 miles. There is a super-quiet all electric version, a hybrid version, and a gas version available. It also has a small helicopter pad where a micro-drone helicopter could operate from. The thing is Dragonspy, and small surface vessels like it, have real potential not just as remote controlled boats with some sensors and a gun, but as a larger system of networked units that can work together as a swarm to accomplish their missions. In the future, we could see ships like the LCS deploy a squadron of similar boats that could range out and provide a screen between marauding ships and the mothership itself. Or they could be used as a team to patrol up inland waterways autonomously, giving their user the exact amount of surveillance coverage they want at any given time. All of this without a putting a human at risk, of course.